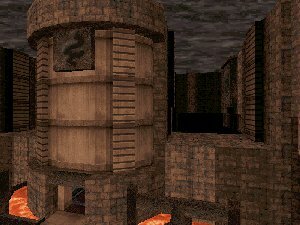 'Anguish' is once again a dukematch map made by Dani J Swanson (WarDome, Despair, Torment). Dani is perhaps the best dukematch map maker out there and definitely one of the best artists. Anguish uses Dani's own gothic texture set which looks very good and fits for the level. Map itself is really well constructed and balanced. Map is symmetrical (I like it) and shadows are top quality. Gameplay rocks quite well (recommended to play against five bots). Then something bad: The only problem with the map is that it looks too much like 'Torment' or 'Despair'. Design style is the same and texture set is the same. Gothic textures are great in this map but Duke's original textures might have worked better because of 'Despair' and 'Torment' which are too much 'Anguish' (or Anguish is too much them). So now we have a great/fun dukematch map with nothing new to offer.